The Phillies started out with high hopes. 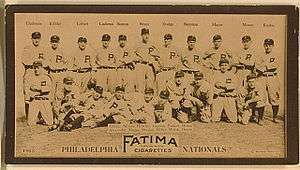 They led the National League on June 25 with a 38–17 record. As the Athletics were dominating the American League, the 2 teams appeared well on their way to meeting in the World Series. But the Phillies lost 13 of their next 16 games to fall into second place, and never recovered. 1913 would mark the closest that the A's and Phillies ever got to meeting in the World Series before the former team moved west.